Joshua Longfield’s North of England Sauce was originally manufactured by Joshua Longfield and Hugh Scott under the company name of Longfield & Scott from 1877 to 1880. The business was listed in the 1880-81 NYC Directory as “sauces” and located at 472 Greenwich Street. Both Longfield and Scott were also listed individually at the same address. 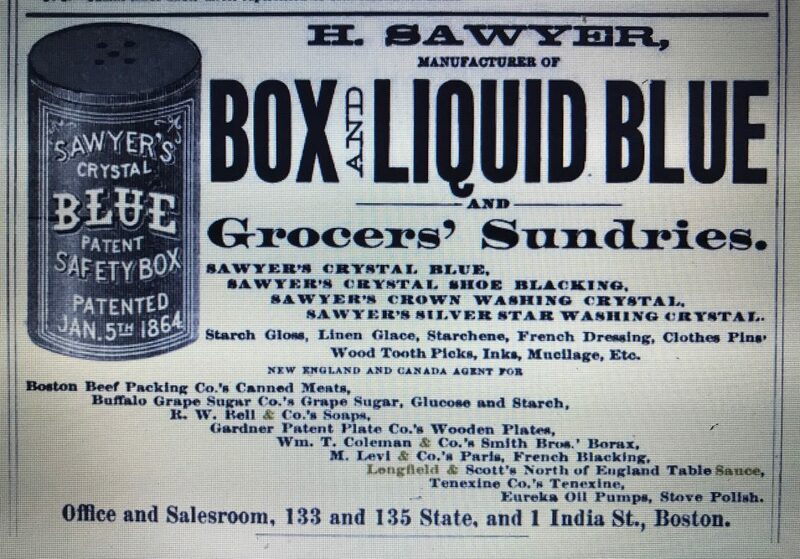 During this period the business was apparently quite successful and growing as evidenced by an advertisement in the 1879 Boston City Directory that announced H. Sawyer as their New England and Canadian agent. Joshua Longfield, Sole Proprietor and Manufacturer of the Celebrated North of England Sauce, No. 259 Greenwich Street.- For delicious flavor, purity and quality, no table sauce yet introduced can begin to compare with the deservedly popular North of England sauce, of which Joshua Longfield, No. 259 Greenwich Street, is the manufacturer and sole proprietor. This is an article of exceptional merit, the very acme of zest givers, and commands an immense sale throughout the whole of the United States, Canada and Mexico, while it is exported largely also to Central and South America. Over one million bottles a year are sold, besides some twenty thousand gallons in bulk, and the demand grows apace. Only absolutely pure and choicest ingredients, directly imported are used in the preparation of the North of England sauce, and the greatest care is exercised in compounding the same. It is put up in quarts, pints and half-pints for the trade, and can be purchased at remarkably low prices of grocers everywhere, having immeasurably the largest sale of any sauce in America. In addition to the commodious quarters occupied at No. 259 Greenwich Street, this city, Mr. Longfield has a depot also at No. 25 South Front Street, Philadelphia, and No. 514 Hayes Street, San Francisco, Cal., and keeps on hand at these establishments a big stock. All orders for any quantity are filled in the most prompt and reliable manner, and exceedingly low prices are quoted, the most liberal inducements being offered to jobbers, hotels, restaurants and large consumers. Mr Longfield, who is a native of England, is a man of long and varied experience in the manufacture of sauces, and had devoted years of effort in experimenting before he perfected the formula according to which the “North of England” is prepared. He has engaged in manufacturing this distinctly meritorious article in New York since 1877. Around 1894 it appears that Joshua Longfield partnered with Garret Bergen and formed the Longfield Bergen Company. Bergen was also listed at several Greenwich Street addresses dating back to the 1880-81 NYC Directory. Prior to 1894, he was usually listed with the occupation produce or sauces, but its not clear whether he worked with Longfield or was a competitor. The 1894 NYC Directory listing for Longfield-Bergen gave their address as 528 Canal Street and included a statement that they were the “mfr’s N of England Sauce, Pride of Long Island Catsup and Grocery Sundries.” In 1896, they listed their address as 472 Greenwich, one of Joshua Longfield’s previous addresses. 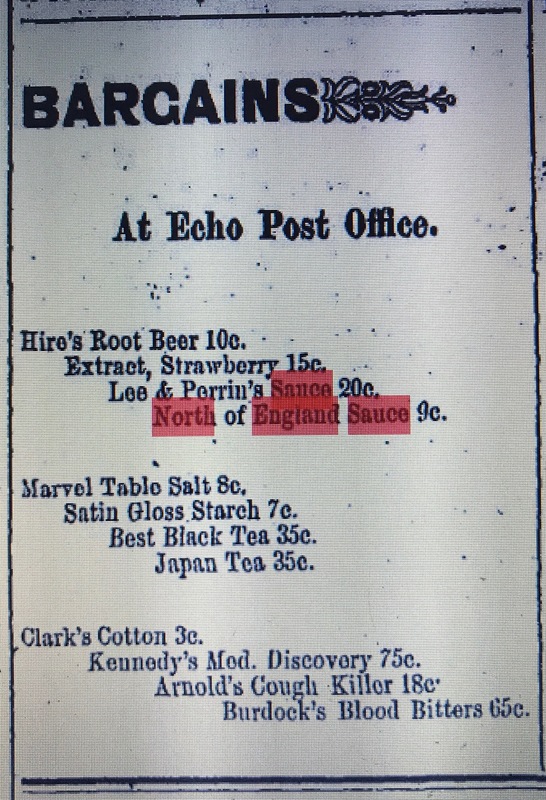 According to an advertisement in the July 24, 1894 issue of the Port Jefferson Echo, during this time you could pick up a bottle of North of England Sauce for 9 cents, less than half the price of Lea & Perrin’s. Apparently, Longfield-Bergen did not last all that long. They were listed in both the 1897 and 1898 NYC business directories under both “sauces” and “mustard.” NYS legislative documents indicate that sometime in 1898 the company legally changed their name to Bergen-Bundenbach, so I assume at this point, Longfield was no longer involved. Then by 1900 it looks like the company was in receivership. Bergen-Bundenbach was still listed in the 1900 directory but the only principal listed with the business was Edward D Farrel (receiver). According to a notice in the Brooklyn Daily Eagle, Garret Bergen filed for personal bankruptcy on March 31, 1901. Bergen resurfaced in the 1903 Brooklyn Directory at 45 Newell Street with the Bergen Monagole Co. A year later, the company name changed to the Garret Bergen Co. Over the next 20 years Garret Bergen Co. was listed in the Brooklyn directories at 122 Sutton and later 248 Varet as either sauce, catsup or supplies. They were also listed in Bridgeton New Jersey between 1918 and 1924. I haven’t found any listings for them after 1926. During this time, analyses performed by several state agricultural departments on Longfield’s Sauce (1907 Pennsylvania and 1911 Connecticut) and Pride of the Farm Catsup (1905 Connecticut, 1912 Florida and 1919 Pennsylvania) all named Garret Bergen Co. as the manufacturer. Based on this information it looks like Joshua Longfield gave up the rights to manufacture his North of England Sauce when he parted ways with Longfield-Bergen and the reorganized Garret Bergen Co. continued to manufacture it up through at least 1911 and possibly as late as 1926. After Longfield-Bergen, Longfield continued doing business under the firm name of Longfield & Co. This company first appeared in the 1896 NYC Directory at 593 Greenwich Street and later, in 1898 and 1899 listed their address as 801 Greenwich Street. Then on August 21, 1900 the Joshua Longfield Sauce Company was incorporated under the laws of South Dakota. Joshua Longfield was no longer involved and it’s likely that he passed away around this time.. The 1901 NYC Copartnership and Corporation Directory listed the business as a South Dakota corporation with capital of $22,500 and an address of 410 West 13th Street in Manhattan. William Manger was named as the first president and Leslie M. Roberts as secretary. Longfield & Co. was also listed in the directories as a “registered trade name” of the Joshua Longfield Sauce Company. Through 1904, Longfield’s, widow, Margaret and stepson, William Horner, remained associated with the business through Longfield & Co. In 1903 the Joshua Longfield Sauce Company moved to 122 Charles Street where they remained until 1909. The NYC directory that year listed the corporation as dissolved. 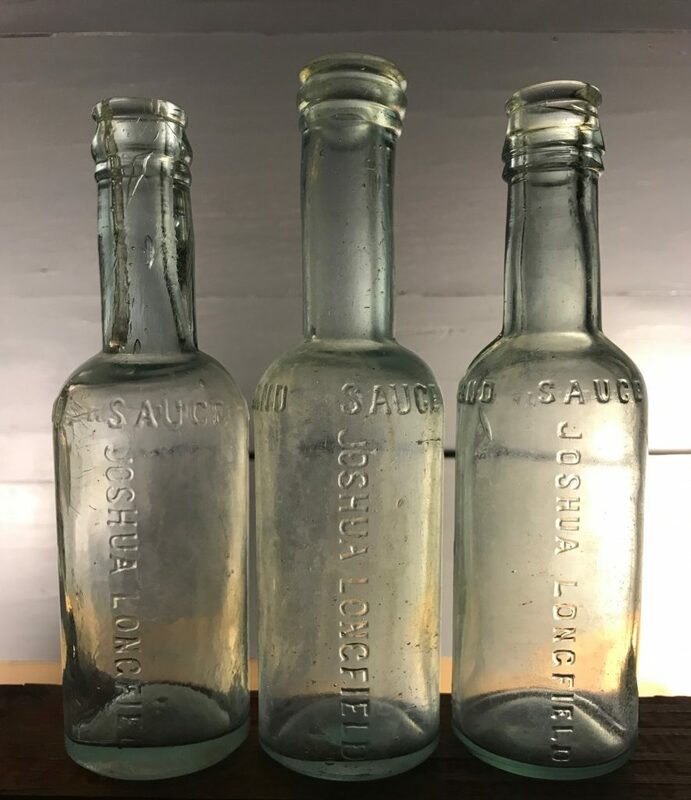 I found three mouth blown sauce bottles, each embossed “North of England Sauce” horizontally around the shoulder and “Joshua Longfield” vertically down the front. Recognizing that neither Scott or Bergen are included on the embossing they probably date between 1880 when Scott left the business and 1894 when the company name changed to Longfield-Bergen. I also found a ketchup bottle embossed “Pride of Long Island Tomato Catsup” on one side and “Bergen’s” on the other. It’s mouth blown with screw threads and probably dates no earlier than 1904 when the company was renamed the Garret Bergen Co.